In November 2017, Sprint had rolled out the Wi-Fi calling (aka VoWiFi) feature to the owners of Samsung Galaxy Note 8. Verizon has now rolled out Wi-Fi calling feature to its Note 8 users. 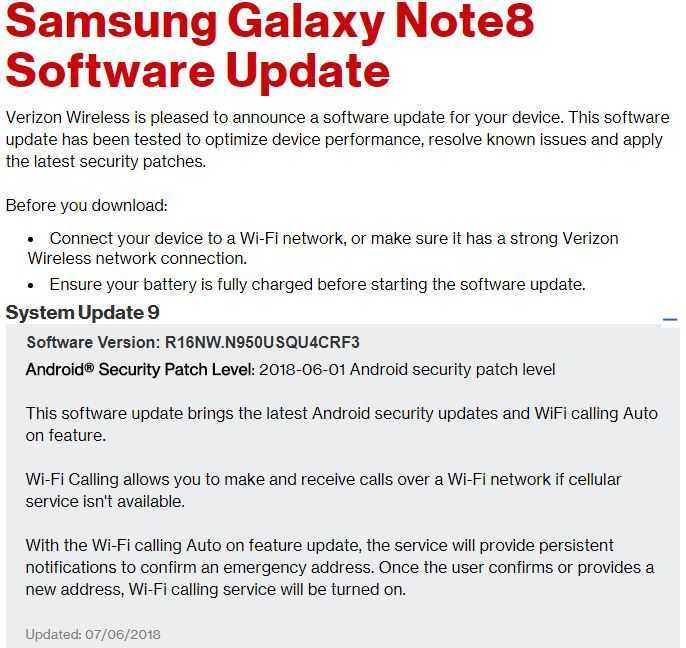 As it can be seen in the below screenshot, the upcoming software update with version R16NW.N950USQU4CRF3 includes the latest Android security patch update for the month of June as well as the Wi-Fi calling Auto on feature. Through Wi-Fi calling, Galaxy Note 8 users can make and receive phone calls through a Wi-Fi network when the cellular network is unavailable. Once the update is installed, the user will see persistent prompts to confirm an emergency address for phone calls made to 911. Once confirmed, the Wi-Fi calling feature will be activated. Making a phone call through Wi-Fi calling will not consume the monthly plan data. Since the calls will be made over Wi-Fi, it will eat up around 1 MB per minute of Wi-Fi data during voice calls. Video calls made can consume around 6 to 8 MB of Wi-Fi data. Verizon users can check whether the feature has been turned on or not by logging into their Verizon account. Verizon recommends its users to connect to stable Wi-Fi stable connection and charge the battery of the phone to the full before installing the update. The carrier is also rolling out June month Android security patch to the users of Galaxy S6 Edge+ and Galaxy Note 5 that were launched in 2015. Even tough the S6 Edge+ and Note 5 are still being treated with the latest Android security updates, these devices are unlikely to receive the Android 8.0 Oreo update. I noticed after the update that you can now force wifi calling on the Vzw Note 8 after the update by putting the phone in airplane mode and then turning wifi back on. It works great for texting and cell calls. What I don’t konw is if it will use wifi if it isn’t forced unless the cell signal is zero. Most of us that need wifi calling have a small cell signal and in the past Verizon would not let you force wifi calling. And the phone would always choose a weak and unstable cell signal over a strong wifi connection. Does anyone know if going to airplane mode to force wifi is necessary after this update?